are looking pretty dry, there is some snowpack in the mountains, albeit the levels are lower than normal. "The snowpack map is showing on the low end of normal, but there is snow. This is going to be a make-or-break year because the storage is already low, but it's too early to know. We could get a couple of good periods of precipitation in March and April to bring it up to normal," said Lazarus. Alberta has experienced back-to-back drought years in the past and SMRID and all members of the Alberta Irrigation District Association (AIDA) have protocols in place should another dry year occur. Imposing water allocations to its licensees is one of the first avenues taken when water becomes an issue. Also, on Nov. 5 of last year, SMRID, along with other members of the AIDA, re-signed the Human Use of Water and Livestock Declaration (originally signed in 2010), a document that prioritizes water usage in the event of a drought situation. "The declaration was a re-signing that recognizes humans and livestock always come first. There's always talk about the irrigation districts having all this water, but humans and livestock come first," he said. "water for basic needs of humans, as defined by the World Health Organization for 'optimal access service level,'and for livestock sustenance will take priority over any water use for irrigation, and that member districts will participate in water sharing with other licence holders in good faith so that sufficient water can be distributed for basic human use and for sustenance for livestock." While the Water Act indicates districts with the more licences will have greater priority, under drought conditions that water must be shared. "We're working very hard with other irrigation districts to share water. The more licences, the more priority. That is in the Water Act, but by water sharing, we all will feel the pain," said Lazarus. Technology for irrigation equipment has improved greatly over the years, with water conservation always being a concern. Last fall, they conducted a survey of irrigators in the Taber Irrigation District (TID) to find out the extent to which precision agriculture technologies are being adopted, the types of tools being used and the satisfaction with the technologies. They also looked at those who didn’t use precision agriculture technologies and their reasons for not adopting. Twenty-seven per cent of irrigators in the TID participated in the survey. The survey showed that, under precision agriculture, crop yields have increased an average 20 per cent and yearly crop quality has increased by an average of 16 per cent. Yearly reductions in irrigation water, fertilizer, herbicides and pesticides have ranged between 14 and 24 per cent. DAVID PARKER David Parker appears regularly in the Herald. Read his columns online at calgaryherald.com/ business. He can be reached at 403-830-4622 or by email at info@davidparker.ca. In the early 1900s, posters produced by the Canadian Pacific Railway were a never-ceasing attraction to passersby of its office in Canon Street, London, that encouraged “Home seekers” and “Land Seekers” to Canada. In 1903, the government of Canada approved a 1.2-millionhectare land grant to the CPR as final compensation for the construction of the railway. And they needed to persuade people to live on those lands and to use its trains to get to them. But the land across the prairies was too dry to produce good crops, so the CPR began work in 1904 on a large gravity-fed canal network drawing water from the Bow River, starting with the weir in Calgary, and diverting it to farms to the east. Water was carried to Reservoir No. 1 — better known today as Chestermere Lake — that was filled for the first time in 1905. By 1944, the CPR decided it no longer wanted to be in the water-distribution business and transferred the system to a group of local farmers. They joined forces to form the Western Irrigation District, which in 2019 will celebrate 75 years of delivering water to 38,500 hectares of land. General manager David McAllister says thanks to irrigation local farmers can grow a diverse array of crops, allowing irrigation producers to take advantage of a wider range of markets. Armed with an engineering degree and an MBA, McAllister was lured back to Alberta after spending 10 years on Vancouver Island, attracted by the opportunity to manage an environmental organization that has more hectares irrigated with less water now because of actions the district and its irrigators have taken to save water. Much had been lost over its more than 1,000 kilometres of canals and pipelines, so the organization is constantly rehabilitating its water delivery system. Smaller canals are being replaced with PVC pipe to eliminate water loss from evaporation or seepage. Larger canals are cleaned and armoured to reduce siltation and improve water quality. Chairman of the board Ray Kettenbach grew up on the family farm, but spent 26 years in corporate communications in the city. All members of the board must be farmers in the irrigation district system. Kettenbach has been a supporter for a number of years and is particularly enthused about its plans to enhance the quality of its water. Much of the stormwater from municipalities goes directly into our rivers, allowing all kinds of contaminants from streets, industrial sites, shopping malls and parking lots to flow through into the canals. Passing through hectares of wetlands can clean the water, but a big problem is the rapid growth of invasive and noxious weeds. The district is leading a plan to separate stormwater from irrigation channels with a parallel system to halt its impact on agriculture. Other rehabilitation, operations and maintenance projects mean that the district has invested more than $100 million in works since 2005. Saving water, putting land to work and enhancing water quality are continuing key initiatives for McAllister and his staff of more than 30 working out of their Strathmore headquarters. He needs more storage for water to be prepared for shortages, and there is a big push to help farmers convert from highpressure to low-pressure pivots. The district controls an amazing system that helps farmers provide table foods from carrots to watermelons, as well as providing water to livestock that also finds its way onto the dinner table. Raw water is supplied to a number of municipalities and to the Balzac area of Rocky View County, and also generates revenue from the City of Chestermere for the use of its lake for recreation. NEWS AND NOTES: Riddell Kurczaba Architecture has appointed Michael Sczesny, formerly studio manager with Norr, as the new managing principal of its Edmonton Office. BY KUHL, NICK ON JULY 21, 2018. 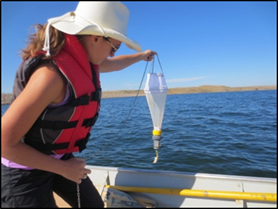 Aquatic Invasive Species Solutions, a Montana-based, private company dedicated to preserving mussel-free waters, will be conducting a pilot study of a boat monitoring program this summer to better understand and prevent the spreading of mussel larvae between lakes. In the fall of 2016, Montana wildlife officials detected larvae of invasive aquatic mussels at Timber Reservoir and suspected samples at Canyon Ferry Reservoir, the Mils and Missouri Rivers. The discovery prompted Governor Steve Bullock to declare a state-wide natural resource emergency, temporarily closing many bodies of water in the state to all boating, including Glacier and Waterton Lakes National Park. Currently, the only line of defence against future infestations of Aquatic Invasive Species is mandatory boat inspections. The boat inspection process can be labour intensive, inconsistent from one agency to another, cost taxpayers and is nearly impossible to visually detect mussel larvae. “We believe this will be a great way for the boating community to be proactive in stopping the spread of AIS,” said Matt Redding, vice-president of AIS Solutions, in a news release. AIS Solutions is a private monitoring company with privacy as their utmost priority, and will only have verification that a boat has or has not entered mussel-positive waters will be indicated to the inspecting agency. If a boat has entered infected waters, that agency will be given further information including location and date to make an accurate determination of decontamination actions. As a part of the upcoming study, a small, waterproof battery and solar-powered GPS will be securely attached to both motorized and non-motorized vessels, including kayaks and SUPs. With inspection, through the use of Geo-Fence technology, both the boat owner and inspector can be alerted when a vessel has entered mussel-infected waters. AIS Solutions believes this to be a good, long-term solution that will allow recreational boaters, anglers and water-users to be proactive to ensure mussel-free water systems and to have access to those waters long into the future. For more information about the upcoming boat monitoring study, visit aissolutions.org.